For most of that possession, the Jazz had to feel great. They kept the ball out of Harden’s hands, contained Gordon’s drive and forced a difficult shot. Nonetheless, Gordon’s bomb put the Rockets up by 18 points. How deflating. This is an extreme example of the effect that Gordon routinely has on opponents. Houston is a pain to defend because it spaces the floor for Harden and Chris Paul, putting a couple of future Hall of Famers in position to do their thing. 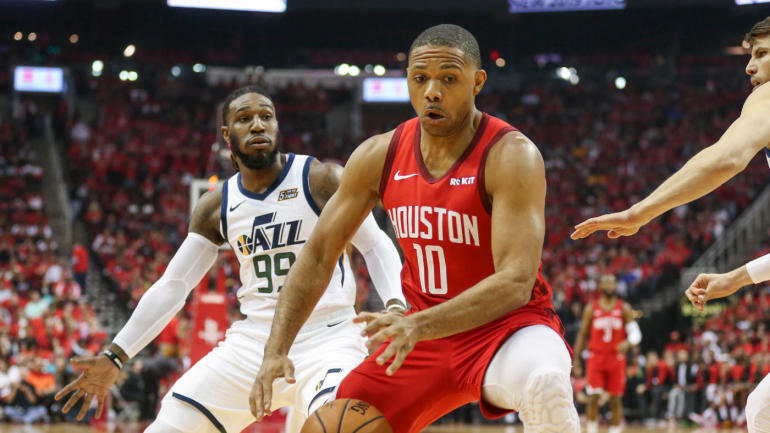 The Rockets are not particularly concerned with being unpredictable or making their role players feel involved on offense, which means their opponents have to contend with Harden and Paul’s playmaking prowess on just about every possession. Every time someone else has the ball, it feels like a small victory. Gordon is often that someone else, and if you relax for a second, he will punish you. Gordon finished with 17 points on 5-for-10 shooting, along with his typically stout defense. It is easy to forget about him, but you shouldn’t. Jaylen Brown replaced the injured Marcus Smart in the Boston Celtics‘ starting lineup and honored the glue guy by having an awesome game despite shooting 1-for-5 and scoring two points. The Celtics took control when they outscored the Indiana Pacers 26-8 in the third quarter, with Brown hounding Bojan Bogdanovic every time Indiana had the ball. Bogdanovic’s breakout after Victor Oladipo‘s injury has been one of the league’s most heartening little storylines. He is the personification of these Pacers, stretching his game out of necessity and discovering that he can get more mileage than anyone thought out of his his funky moves. He turned into Indiana’s No. 1 option, averaging 20.7 points with a 61.3 percent true shooting percentage and a 25.1 percent usage rate since Oladipo went down. In the playoffs, confidence can carry over from game to game. Brown didn’t want Bogdanovic to feel good about himself. It was more or less like this whenever Leonard decided to attack. The Orlando Magic are long and disciplined on defense, but Leonard had little trouble getting to his spots. He finished with a team-high 25 points on 10-for-18 shooting, plus six rebounds and three assists, and he made two clutch jumpers in the final two minutes. After D.J. Augustin’s game-winner, though, the main talking point about Leonard has been another number: His 33 minutes. The Magic had the league’s eighth-best defense in the regular season, and they will deserve immense credit if they keep playing with the same poise and purpose they showed in Game 1. If Leonard is not as aggressive as he can be, though, he is letting them off the hook. It’s hard to believe the Oklahoma City Thunder came as close as they did to a road victory when they shot 5-for-33 (15.2 percent) from 3-point range. Oklahoma City has basically always been a poor shooting team — this year, it ranked 23rd in 3-point accuracy and 29th in midrange accuracy, per Cleaning The Glass — but this was particularly rough. Paul George went 4-for-15 from deep, Russell Westbrook 0-for-4 and Dennis Schroder 0-for-7. Most of these looks were good — according to NBA.com’s tracking data, the Thunder shot 1-for-15 on “open” 3s (with the closest defender four to six feet away) and 3-for-13 on “wide-open” 3s (with the closest defender six or more feet away). I have a theory that teams with good shooting have a built-in chemistry advantage. There is a certain trust that comes with having confidence that everyone on the floor can deliver when left open. It is impressive, then, that Oklahoma City stuck together and cut into the Blazers’ lead after a bunch of sequences like the one above. This was a one-point game with less than three minutes left, a reflection of the fact that the Thunder have built an identity around forcing turnovers, playing with pace and gobbling up offensive rebounds. If only just a couple more of those 3s had fallen.